The instruments on this page are marked out of stock, but only because at this time I am not sending instruments through the post. Please use this page as a price guide, and call for availability if you are interested in purchasing. If you are shopping around, please note that these prices may be a little higher than you expect. 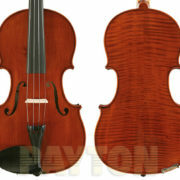 These violins have been professionally adjusted to correct the typical faults they come with from the factories, and the factory strings have been replaced with quality strings. 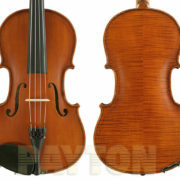 These violins are ready to play, and include a warranty. If you need a shoulder rest, you can find them on the accessories page here. Salieri Viola Outfit, Spruce top, maple sides, back and neck. 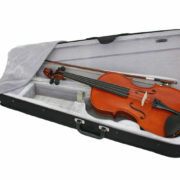 Supplied with a quality bow, AXL metal tailpiece and shaped case. Sizes 15.5 inches & 16 inches. 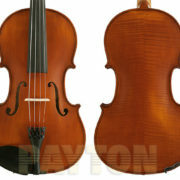 Enrico "Student Extra" Series Viola Outfit. Size: 11 inches to 16 inches.